Religious festivals are important events throughout the Bhutan, commemorating the deeds of Buddha or those of the great masters of the days gone by associated with one Buddha tradition or another. In addition these are yearly festivals celebrated with great fanfare in places around Bhutan based on an auspicious day of the lunar calendar. The most renown of this festivals are theTsechu(means tenth day) where by one of the days of the festival falls on the tenth day of the lunar calendar and the most sacred and important performances of mask dances and prayers are performed on the tenth day. Most commonly such festivals usually last from three to five days. Locally referred to as ‘Guru Rimpoche’ or, simply as ‘Guru,’ this eighth century master, introduced the Nyingma school of Buddhism in Tibet and Bhutan. Each 10th day of the lunar calendar is said to commemorate a special event in the life of Padmasambhava and some of these are dramatized in the context of a religious festival. 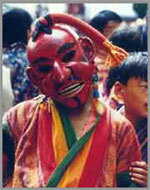 During such festivals masked dances known as chams are performed to bless the onlookers, to teach them the Buddhist dharma, to protect them from misfortune, to exorcise all evils. These masked dancers who take on the aspects of wrathful and compassionate deities , heroes, demons and animals represents the symbol of protection. Its believed that merit is gained by attending such religious festivals. Onlookers rarely fail to notice the Atsaras or clowns who move through the crowd mimicking the masked dancers and performing comic routines in their masks with long red noses and faces. BMH was the official tour company during the Guinness World Record Tree Planation in June 2015 at Kuenselphodrang, Thimphu. Copyright ©. Bhutan Mountain Holiday. All rights reserved.